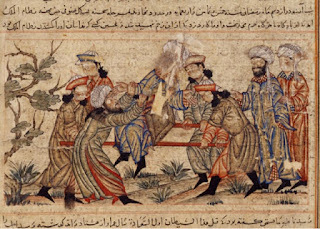 The murder of Nizam al-Mulk, considered the Assassin's first political killing. 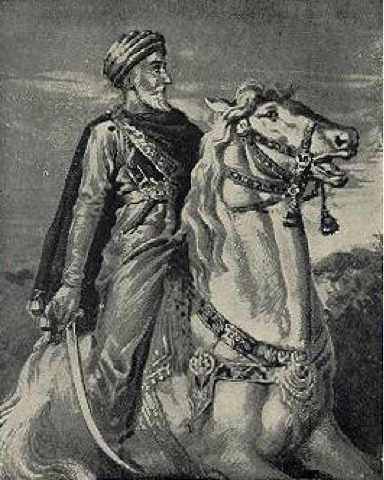 of Persia and Syria developed a unique form of asymmetric warfare to offset the far superior military might of their enemies: a secret order of political killers known as the fidai. The Fidai were young men prepared to spend years learning new languages and customs, and to face almost certain death, all for the opportunity to sink a knife into the target of their leader's choice. To their enemies, these solitary warriors became known as the Ḥashshashin -- giving rise to the modern term of assassin. The Ḥashshashin generally chose political targets, selecting high-ranking leaders who had mounted campaigns against the Ismailis. 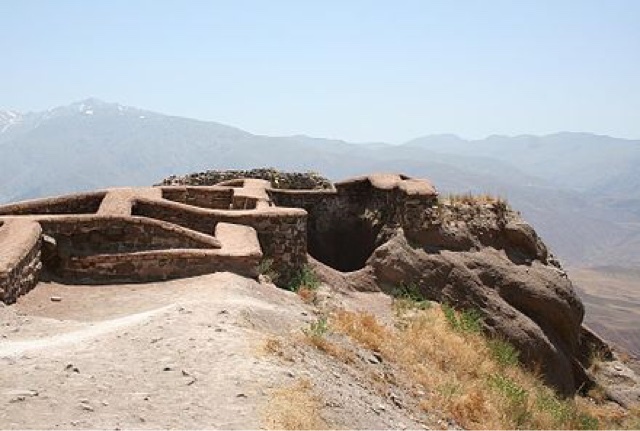 The founder of the Assassins was Hassan-i Sabbah, a devout Ismaili who brought his followers to the castle of Alamut, in northwestern Iran, after he took the fortress. The castle reportedly held a vast library of texts, many destroyed as heretical when the castle finally fell in 1256. As the Grand Headmaster of the Order, Sabbah never left the fortified Alamut. He created a complex hierarchy below him, with the fully initiated Da’i (preachers) on top, followed by the partially initiated Rafiqs, or comrades, and lastly the Lasiqs, or adherents. The Fidai were selected from the final group, but received extensive training and education to carry out their missions. The killings by the Assassins had significant psychological impact, since they were often performed in public by a Fidai who had infiltrated a target’s inner circle. This gave the group disproportionate political influence, given that they held only scattered fortresses and had no large standing army. The remains of Alamut in Iran. The entire sect was known as the Ḥashshashin, a term now thought to be a derogatory word meaning ‘outcasts’, but it was taken up by Western writers to refer to the supposed hashish use by the sect and its leaders. Lurid tales of adherents entranced by drugs and lured into service by promises of a paradise after death have more recently been called into question. Many of the stories originated from accounts by the Nizari’s enemies and questionable retellings from Westerners such as Marco Polo. The preferred weapon of the Fidai was a dagger, so that the killing took place close up and left the attacker little chance to flee. The Fidai's willingness to sacrifice his life for the cause added to the sect’s fearsome reputation. Many details of the medieval Nizari Ismaili's scholarship and imagery have been lost to history. The Ḥashshashin in Hungary were said to take on the symbol of the hajal, a partridge-like bird, and worked for a time as mercenaries before being eliminated by the Inquisition. A green flag was raised over Alamut, with a prophecy that a red flag, symbolizing the return of the hidden Iman, would someday be lifted above the fortress. A combined green and red flag was created in the 19th century for the Nizari. Another symbol associated with the Ismaili is the heptogram, or seven-pointed star. The Ḥashshashin sect was largely eradicated by the Mongol Empire, although some members survived as assassins for hire and hid their true identities. The Nizari Ismailis today form the second largest branch of Shia Islam and the denomination has over 15 million adherents in many countries. The deadly Fidai of Hassan Sabbah have faded into history, but the name and myth of the Assassin live on. 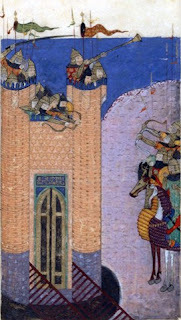 Painting of the siege of Alamut by the Mongols.